No time to react. No time to adjust. No time to recover. No time to anticipate the landing. First thoughts: "I hope I can still ride" which is, presumably, the thoughts of us all after we stop sliding. It's the holidays so it would be a great idea to take my 13 year old son to a trail centre. He's not been to one before and it would be a good son-dad bonding thing and we both get to ride our bikes. Everyone's a winner. 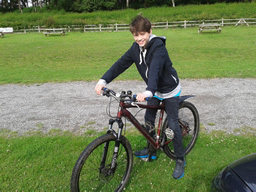 Gisburn Forest is a bit more novice friendly than Llandegla so, if all went well on this first trip, at October half term we'd push the boat out and head out to North Wales. As a warm up and to give my son an idea of what lay ahead we took in a fairly flat, twisty trail loop that led back to the car park. I've done it before and was heading for a quick segment time. 20 yards and 3 little bends to go and it was finished. It wasn't to be as the first bend spat me off. 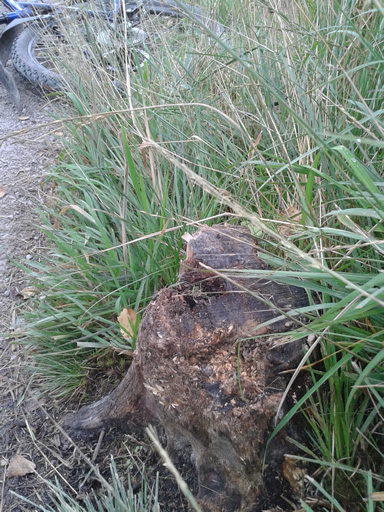 Very carefully hidden in 10 inches of grass was an 8 inch high tree stump which my pedal smashed into. Judging by the gouges on it, my pedals are not the first that have had their progress halted. The trails are about 2 feet wide. The soft, grassy forest floor is thousands and thousands of feet wide. How come I landed sprawled out entirely within that 2 foot space? After realising I was ok, just scratches and bruises (and 5 little stones embeded in my helmet), it was time to look at the bike. I nearly pushed it to the road in order to finish off the segment but decided not to bother. Apart from a slightly torn left grip all was looking well. I got back on, pedalled and couldn't get my foot into the cleats properly. 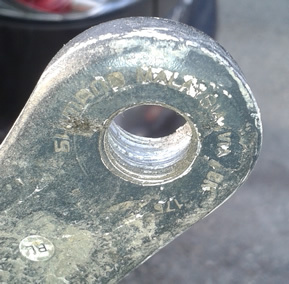 The pedal was at a 45 degree angle from the crank arm. No problem as were back at the car park and I've got my pedal spanner. Taking the pedal out removed most of the trhreads that the crash hadn't. This could be a disaster. I tightened it as tight as it would go, got back on, did a few laps of the skills circuit and the pedal came away from the arm. I'll have to butcher the geared mtb a bit more. I've alreay pinched the rear wheel off it, now for the crank arm. A new plan was put into operation. I sent my son off on his own and said to get back to the car in an hour. He might as well get some riding in as we were here. An hour. What can I do for an hour? Could I ride the downhills and walk the ups? What a great idea! I changed into my trainers so I could walk more easily than in the clipped shoes and set off down the first red. Initial thoughts were centred on my perineum as with no suspension and no way to stand up on the pedals to relieve the battering it was getting got me thinking this wasn't my finest idea. Corners weren't much fun either without being able to shift my weight and drop offs were just as much fun. It was amazing how many tiny uphill bits there are on a downhill trail that kill all your momentum. I felt like I was back in the early 1800's riding one of those push-along bikes before the invention of pedals. I adopted a technique for the flats which involved balancing my right foot on the end of the crank arm and pushing so my left foot could, kind of, pedal properly. It sort of worked but it was easier walking. This one goes down to experience as I should have left my clipped shoes onin ordr to lift the pedal back up. 58 minutes after setting off I arrived back at the car to find my son with his trouser leg rolled up revealing a slightly battered knee.